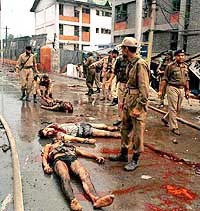 Bodies of three of the 15 persons killed in the fidayeen attack in Srinagar on Monday. Body of a traffic policeman being removed from the scene of explosion outside the main gate of Jammu and Kashmir Assembly. At least 29 persons, including four security personnel, were killed and 60 others wounded in a major car explosion that wrecked the road entrance and the security bunker outside the Assembly complex in Srinagar today. According to Mr Najib Sorawardhy, Minister of State for Home, two fidayeen and 29 persons were killed in the attack. The police said the toll could increase as more than 10 injured civilians were battling for life in hospital. The police confirmed that the explosion was carried out by fidayeen. Jash-e-Mohammad has claimed the responsibility for the attack. The outfit spokesman also claimed that some fidayeen had sneaked into the Assembly premises. A UNI report said the militants holed up inside the House were killed. 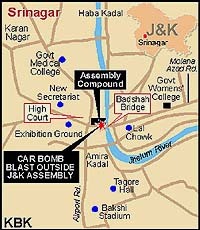 Official reports said soon after the Assembly session ended and legislators and ministers left the complex and transport services resumed on the road, a car carrying high-grade RDX explosive rammed into Assembly gate, exploding on impact. Windowpanes of adjoining buildings were also shattered. The reports said the security forces immediately opened fire in which several civilians were wounded. The fidayeen also hurled three grenades inside the lawns of the complex, indicating that more than four fidayeen had been assigned the task of blowing up the Assembly secretariat. According to eyewitnesses, the blast and the grenade attack left several bodies totally mutilated and some of them headless. The police said 20 bodies had been brought to the police control room so far. The police said traffic was prohibited until such time the Assembly was in progress. When today’s session ended around 1.30 p.m., vehicular traffic was resumed and within 10 minutes the car crashed into the gate and there was a big explosion. Police reports said four fidayeen had stolen a Tata Sumo, from the Barbershah area, 2 km from the Assembly complex. The vehicle was attached with the Department of Telecommunications on hire. The militants disguised as security personnel had hijacked the vehicle 10 minutes before they carried out the attack. The driver of the vehicle, who was released earlier, put the number of militants at three, the sources said. As the vehicle reached the gate, three fidayeen jumped out while one was killed on the spot. Army commandos were called and the entire complex cordoned off. Several officials of the Assembly, including the Assembly secretary, Mr Iqbal Ganai, are holed up inside their offices as the fidayeen and the security forces continue to exchange fire. Only the Chairman and the Deputy Chairman of the Legislative Council managed to come out of their offices unhurt. The Speaker, Mr Abdul Ahad Vakil, was still believed to be in the complex. Among those killed include a school-girl Humera and five employees of the secretariat. Two Srinagar-based newspapers received a call from Jash-e-Mohammed spokesman, informing them that the two fidayeen had kept 14 Assembly employees hostage. Among the five Assembly employees killed, four have been identified as Ashok Kumar (driver), Gulzar Ahmed, Abdul Gani and M.K. Handa. Rauf Ahmed (assistant information officer) was also killed. 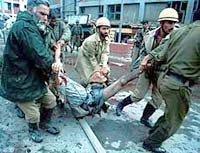 The four police and CRPF constables who were killed are Bashir Ahmed, Rohit Kumar, Khursheed and Lal Mohan. Mr Abdul Qayoom, Deputy Secretary of the Legislative Council and Mohammed Shafi Under Secretary of the Legislative Assembly, were also killed. Their bodies were identified late this evening before they were handed over to their family members. The IGP, Mr Ashok Bhan, told journalists that there were about 100-125 persons inside the Assembly when the blast occurred. Though most of them had been evacuated, there were still seven to eight employees inside, he said. NEW DELHI: Prime Minister Atal Behari Vajpayee condoled the killings of several innocent persons in the fidayeen attack on Srinagar on Monday. Talking to newspersons after a function at Rashtrapati Bhavan, Mr Vajpayee said it clearly showed the detailed planning made by these militants for such a level of attack. He said the entire world was united to fight against global terrorism. The historic Legislative Council complex was badly damaged in a devastating fire that resulted on account of exchange of heavy firing between two fidayeen and the troops late this evening. Official reports said after the security forces found it difficult to flush out the fidayeen from the century-old complex, they fired inflammatory material which was retaliated with firing. In the process, the majestic complex caught fire.